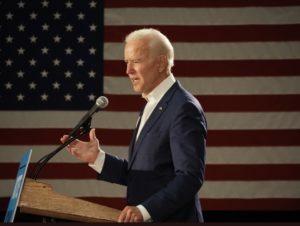 Former Vice President Joe Biden delivered an uplifting speech tonight near St. Louis in support of Democratic U.S. Senator Claire McCaskill and eastern Missouri Congressional candidate Cort VanOstran. At the Machinists’ Hall in Bridgeton, Biden said there’s something different about this year’s election. Biden said hate will continue to grow if people don’t speak up. His message appeared to be directed to President Donald Trump and some in the Republican Party. Biden said the only thing strong enough to tear America apart is America itself. Biden went on to say the U.S. is better positioned than any other nation to own the 21st century. He said there’s nothing beyond America’s capacity. Tom Bauer of St. Louis attended the rally. He said Democrats must take over the U.S. House. McCaskill faces a tight reelection bid next Tuesday against Republican challenger and Missouri Attorney General Josh Hawley. VanOstran faces Republican incumbent Ann Wagner. 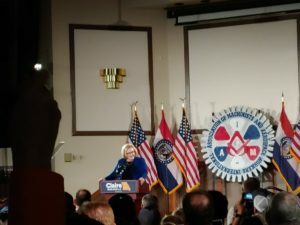 According to McCaskill’s campaign, more than 1,000 people attended Wednesday night’s rally. Future St. Louis County Prosecuting Attorney Wesley Bell also talked on stage. Another known Democrat attending the rally was State Sen. Jill Schupp of Creve Coeur.